What a handsome gentleman. This is just wonderfully rendered, Mary Anne. Love the swoopy brush stroke feathers. Wow. Great color, contrast and brushwork. You are back home just in time for spring in your north east. Are you missing Florida? I can't believe I didn't see this picture. Your other blog is the one that shows up on my blog list. I may have to add this one too. 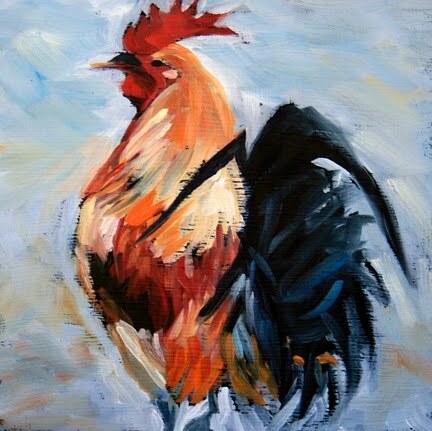 This rooster is fantastic. Nice and loose with gorgeous colors and you've captured his attitude. Ah! Truly somthing to crow about! Isn't he handsome. GREAT composition. Great color and brushwork. Loose, but controlled.